Lenovo Storage V3700 V2 and V3700 V2 XP (Machine Type 6535) are members of the Lenovo Storage V Series family of disk systems. 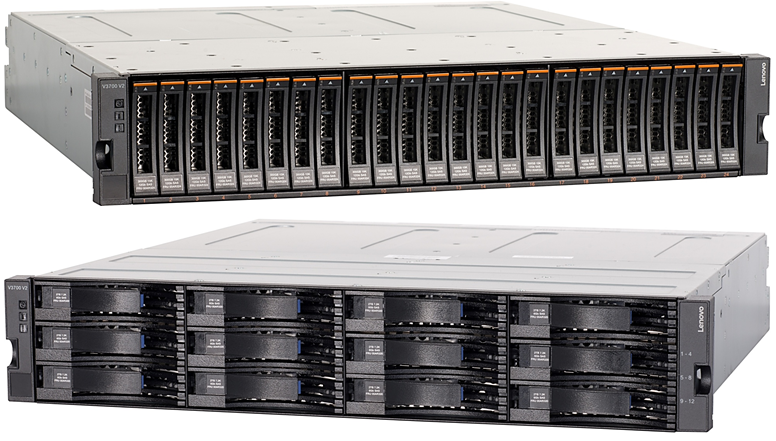 By using IBM Spectrum Virtualize software functions, interoperability, and management tools, Lenovo Storage V3700 V2 and V3700 V2 XP deliver innovation and new levels of storage efficiency with ease of use in an entry-level disk system to enable organizations to overcome their storage challenges. This product guide provides essential technical and pre-sales information on the Lenovo Storage V3700 V2 and V3700 V2 XP storage systems, their key features and specifications, components and options, and configuration guidelines. This guide is intended for technical specialists, sales specialists, sales engineers, and IT architects who want to learn more about Lenovo Storage V3700 V2 and V3700 V2 XP and consider their use in IT solutions. Lenovo Storage V3700 V2 and V3700 V2 XP storage systems feature two node canisters, with 8 GB cache per canister, upgradeable to 16 GB per canister (V3700 XP only), in a compact, 2U, 19-inch rack mount enclosure. 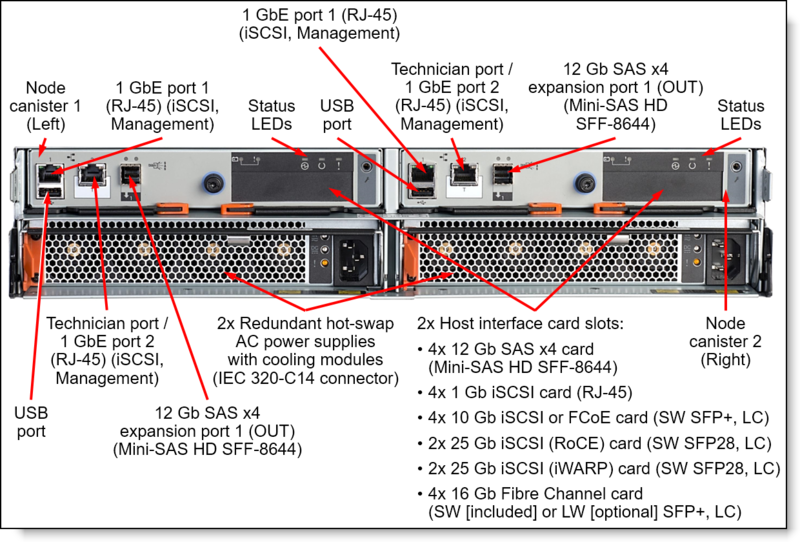 12 Gb SAS (V3700 V2 XP only) and 1 Gb iSCSI connectivity is standard, with an option for additional 1 Gb iSCSI, 12 Gb SAS, 16 Gb Fibre Channel (FC), 10 Gb iSCSI or Fibre Channel over Ethernet (FCoE), or 25 Gb iSCSI connectivity. Lenovo Storage V3700 V2 and V3700 V2 XP support up to 264 drives with up to ten expansion enclosures. They also offer flexible drive configurations with the choice of 2.5-in. and 3.5-in. form factors, 10 K or 15 K rpm SAS and 7.2 K rpm NL SAS hard disk drives (HDDs), and SAS solid-state drives (SSDs). The Lenovo Storage V3700 V2 and V3700 V2 XP enclosures are shown in the following figure. Lenovo Storage V3700 V2 and V3700 V2 XP provide small and midsized organizations with the ability to consolidate and share data at an affordable price, while utilizing advanced software capabilities that often are found in more expensive systems. Lenovo Storage V3700 V2 and V3700 V2 XP can be scaled up to 4.055 PB of raw storage capacity. Lenovo Storage V3700 V2 offers hybrid block storage connectivity with support for 1 Gb iSCSI and 12 Gb SAS, 10 Gb iSCSI or FCoE, 25 Gb iSCSI, or 16 Gb FC host connectivity at the same time. With Lenovo Storage V3700 V2 XP 12 Gb SAS, 1 Gb iSCSI, and 10 Gb iSCSI or FCoE, 25 Gb iSCSI, or 16 Gb FC can be used simultaneously. Scalable, modular storage with dual-active intelligent array node canisters with 8 GB (V3700 V2) or up to 16 GB (V3700 V2 XP) cache per canister. Flexible host connectivity to match diverse client needs with support for 12 Gb SAS (V3700 V2 XP) and 1 Gb iSCSI connectivity standard, with optional 10 Gb iSCSI or FCoE, 25 Gb iSCSI, 16 Gb FC, or extra 12 Gb SAS or 1 Gb iSCSI connectivity. 12 Gb SAS drive-side connectivity with support for 12x 3.5-inch large form factor (LFF) or 24x 2.5-inch small form factor (SFF) drives in the control enclosure; scalable up to 132 LFF drives per system with the attachment of up to 10 LFF expansion enclosures (12x LFF drives each) or up to 264 SFF drives per system with the attachment of up to 10 SFF expansion enclosures (24x SFF drives each) to satisfy growing needs for storage capacity and performance. Rich set of standard functions are available at no extra cost, including virtualized internal storage, thin provisioning, data reduction pools, one-way data migration, FlashCopy snapshots (up to 64 targets), and embedded GUI. Optional licensed functions, including higher number of FlashCopy snapshots, Easy Tier, encryption (V3700 V2 XP only), and Remote Mirroring. Lenovo Storage V Series systems that are based on Spectrum Virtualize software provide five 9’s (99.999%) availability which means an average annual downtime of less than five minutes. The Lenovo Storage V3700 V2 and V3700 V2 XP support the complete range of data storage requirements, from highly utilized applications to high-capacity, low usage applications, with the flexible choice of drives. Up to ten Lenovo Storage V3700 V2 expansion enclosures are supported by a single Lenovo Storage V3700 V2 or V3700 V2 XP control enclosure. Customers can intermix 3.5-inch and 2.5-inch expansion enclosures behind a 3.5-inch or 2.5-inch control enclosure. This configuration delivers the added flexibility to mix 3.5-inch and 2.5-inch drives within a single system (but not within the enclosure). More drives and expansion enclosures are designed to be dynamically added with virtually no downtime, which helps to quickly and seamlessly respond to ever-growing capacity demands. The following figure shows the front of the Lenovo Storage V3700 V2 or V3700 V2 XP SFF enclosure. The following figure shows the front of the Lenovo Storage V3700 V2 or V3700 V2 XP LFF enclosure. The following figure shows the rear of the Lenovo Storage V3700 V2 Control Enclosure. The following figure shows the rear view of the Lenovo Storage V3700 V2 XP Control Enclosure. The following figure shows the rear of the Lenovo Storage V3700 V2 Expansion Enclosure. The following table lists the Lenovo Storage V3700 V2 and V3700 V2 XP storage system specifications. configuration Dual controller (known as node canister) configuration. RAID levels RAID 0, 1, 5, 6, and 10; Distributed RAID 5 and 6. Controller cache 16 GB per system (8 GB per node canister). V3700 XP is upgradeable to 32 GB (16 GB per node canister). Cache mirroring between the node canisters. Flash-backed cache protection (includes battery). Host operating systems^ Microsoft Windows Server 2012, 2012 R2, and 2016; Red Hat Enterprise Linux (RHEL) 6 and 7; SUSE Linux Enterprise Server (SLES) 11 and 12; VMware vSphere 5.1, 5.5, 6.0, and 6.5. Standard software features Virtualization of internal storage, Thin Provisioning, Data reduction pools, One-way Data Migration, FlashCopy snapshots (up to 64 targets), and Embedded GUI. Optional software features FlashCopy snapshots upgrade (up to 2048 targets), Easy Tier, Encryption (V3700 XP only), and Remote Mirroring. Power supply Two redundant hot-swap 800 W AC power supplies. Hot-swap parts Node canisters, expansion canisters, SFP+/SFP28 transceivers, drives, power supplies with fans. Warranty Three-year customer-replaceable unit and onsite warranty with 9x5 next business day terms. Optional warranty service upgrades are available through Lenovo: 24x7 coverage, 2-hour or 4-hour response time, 6-hour or 24-hour committed repair, 1-year or 2-year warranty extensions, YourDrive YourData. * Internal performance measurements with SSDs. The following table lists the models of the Lenovo Storage V3700 V2 and V3700 V2 XP control enclosures. Note: The control enclosures come standard without power cords; the power cord option must be purchased together with the enclosure (see Power supplies and cables for details). The Lenovo Storage V3700 V2 and V3700 V2 XP control enclosures ship with two node canisters. A node canister provides interfaces for host connectivity, management, and internal drives, and it runs storage management and virtualization software. Each Lenovo Storage V3700 V2 or V3700 V2 XP control enclosure ships with 16 GB of battery-backed cache (8 GB per node canister). The Lenovo Storage V3700 V2 XP control enclosures can be upgraded to 32 GB (16 GB per node canister). The following table lists cache upgrade option. Both node canisters must have the same type of the host interface card installed, and both cards must have SFP+/SFP28 modules of the same type. 25 Gb iSCSI host interface cards do not support FCoE. The following tables list the available host port configurations for the Lenovo Storage V3700 V2 and V3700 V2 XP control enclosures. The following table lists ordering information for the host connectivity options that are supported with the Lenovo Storage V3700 V2 and V3700 V2 XP control enclosures. * Up to two LW SFP+ module pairs per 16 Gb FC host interface card in the node canister; both node canisters must have the same connectivity type. The LW SFP+ modules replace the SW SFP+ modules that ship standard with the 16 Gb FC HIC. 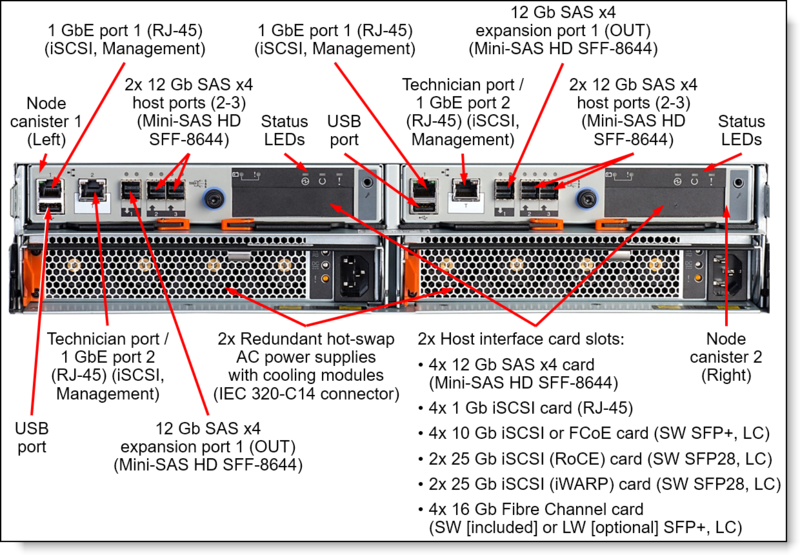 ** Maximum quantity shown is for models without / with integrated 12 Gb SAS host ports. The Lenovo Storage V3700 V2 and V3700 V2 XP control enclosures provide 12 Gb SAS internal dual-port drive connectivity, and each control enclosure also has two 12 Gb SAS x4 (Mini-SAS HD SFF-8644) ports (1 port per node canister) for 12 Gb SAS expansion enclosure connectivity. The Lenovo Storage V3700 V2 and V3700 V2 XP control enclosures supports attachment of up to ten Lenovo Storage V3700 V2 expansion enclosures. Intermix of LFF and SFF enclosures is supported. The enclosures can be added to the system non-disruptively. The following table lists the models of the Lenovo Storage V3700 V2 expansion enclosures. Note: The expansion enclosures come standard without power cords; the power cord option must be purchased together with the enclosure (see Power supplies and cables for details). Each Lenovo Storage V3700 V2 expansion enclosure ships with two expansion canisters. Each expansion canister provides 12 Gb SAS connectivity to the internal drives and two external 12 Gb SAS x4 ports (Mini-SAS HD SFF-8644 connectors labelled Port 1 and Port 2) that are used for connections to the Lenovo Storage V3700 V2 or V3700 V2 XP node canisters and for daisy chaining the expansion enclosures between each other. The expansion port (Port 1) on the left and right node canisters is connected to the Port 1 on the left and right expansion canisters, respectively. The Port 2 on the left and right expansion canisters is connected to the Port 1 on the left and right expansion canisters in the adjacent enclosure, respectively, and so on. The following table lists ordering information for the connectivity options that are supported with the expansion enclosures. * One cable per expansion canister; two cables are required per each expansion enclosure. The Lenovo Storage V3700 V2 and V3700 V2 XP LFF control and expansion enclosures support up to 12 LFF hot-swap drives, and the SFF enclosures support up to 24 SFF hot-swap drives. The following table lists drive options that are supported with the Lenovo Storage V3700 V2 and V3700 V2 XP LFF enclosures. The following table lists drive options that are supported with the Lenovo Storage V3700 V2 and V3700 V2 XP SFF enclosures. Help deliver consistent performance from compressed volumes and increase existing capacity utilization by automatically de-allocating and reclaiming capacity of thin-provisioned volumes containing deleted data and enabling this reclaimed capacity to be reused by other volumes. Enables easy and nondisruptive moves of volumes from another storage system onto the Lenovo Storage V3700 V2 or V3700 V2 XP storage system by using FC or SAS connectivity. Enables creation of copies of data for backup, parallel processing, testing, and development, and have the copies available almost immediately. Lenovo Storage V3700 V2 and V3700 V2 XP storage systems support up to 64 targets per system at no charge. Intuitive, web-based next-generation GUI for easy system set up and management. The Lenovo Storage V3700 V2 and V3700 V2 XP storage capabilities can be expanded with optional licensed functions. Each optional software function is licensed on a per-system basis and covers controller enclosure and all attached expansion enclosures. To help evaluate the benefits of these new capabilities, licensed functions (with the exception of FlashCopy upgrade) can be enabled at no charge for a 90-day trial period. Trials are started from the Lenovo Storage management GUI and do not require any Lenovo intervention. Upon expiration of the trial, the function is automatically disabled unless a license key for that function was installed onto the machine. Enables creation of copies of data for backup, parallel processing, testing, and development, and have the copies available almost immediately. Lenovo Storage V3700 V2 and V3700 V2 XP storage systems support up to 64 targets per system at no charge. The FlashCopy upgrade option increases this support to 2,048 FlashCopy targets per system. The encryption feature is supported on the Lenovo Storage V3700 V2 XP system, and it provides encryption for data at rest for enhanced data security. Encryption is performed by the V3700 V2 XP control enclosure for data that is stored within the system (the control enclosure and all attached expansion enclosures). Encryption feature does not require self-encrypting drives (SEDs); it works with traditional drives. Encryption is enabled on the entire V3700 V2 XP system (the control enclosure and all attached expansion enclosures). Global Mirror operates asynchronously and helps maintain a copy at much greater distances (up to 8000 km). For ultimate flexibility, Lenovo Storage V3700 V2 and V3700 V2 XP remote mirroring interoperates with any Lenovo Storage V Series, Storwize for Lenovo, or IBM Storwize family system, including Storwize V3700, Storwize V7000, Storwize V5000, and SAN Volume Controller. The remote mirroring option must be acquired (or licensed) for the primary (local) and secondary (remote) systems. If the Lenovo Storage V3700 V2 or V3700 V2 XP is mirrored to another system, the other system must have the appropriate and applicable license for remote mirroring. The following tables list ordering information for optional software features for the Lenovo Storage V3700 V2 and V3700 V2 XP. The Lenovo Storage V3700 V2 XP supports encryption for data at rest. Encryption is performed by the control enclosure for data stored within the system (the control enclosure and all attached expansion enclosures). Encryption is enabled on Lenovo Storage V3700 V2 XP through the acquisition of the Encryption Enablement feature. This feature enables encryption on the entire V3700 V2 XP system (control enclosure and all attached expansion enclosures). The Encryption USB Flash Drives (Four Pack) feature is required when the Encryption Enablement feature is acquired. This feature provides four USB flash drives for storing the encryption master access key. This feature can also be ordered if more USB flash drives are needed. The following table lists ordering information for the encryption options. The Lenovo Storage V3700 V2 and V3700 V2 XP enclosures have two redundant hot-swap 800 W AC power supplies, each with an IEC 320-C14 connector. The Lenovo Storage V3700 V2 and V3700 V2 XP enclosures ship standard without power cables. Rack power cords or country-specific line cords should be ordered with the enclosures (see the following table; each part number or feature code contains two power cords that are needed per one enclosure). The Lenovo Storage V3700 V2 and V3700 V2 XP have a three-year Customer Replaceable Unit (CRU) and onsite warranty with 9x5/next business day (NBD) terms. Remote Technical Support (RTS) provides comprehensive technical call center support for 1 or 3 years. RTS can reduce problem resolution time, which helps decrease the cost to address technical problems and increase uptime. Lenovo provides end-to-end storage compatibility testing to deliver interoperability throughout the network. The Lenovo Storage V3700 V2 and V3700 V2 XP support attachment to Lenovo servers by using SAS, iSCSI, FC, or FC over Ethernet (FCoE) storage connectivity protocols. Hybrid storage connectivity also is supported. The following table lists currently available SAS adapters for Lenovo servers that are compatible with the Lenovo Storage V3700 V2 and V3700 V2 XP SAS storage (direct attach). The Lenovo Storage V3700 V2 and V3700 V2 XP support end-to-end 10 Gb FCoE connectivity with native FCoE ports or FCoE connectivity via FCoE/FC gateways with native FC ports. Lenovo RackSwitch™, Brocade, and Cisco converged switches can be used to provide FCoE connectivity for the Lenovo Storage V3700 V2 and V3700 V2 XP FC storage. The Lenovo Storage V3700 V2 and V3700 V2 XP also support iSCSI attachments via standard 1 Gb, 10 Gb, or 25 Gb Ethernet network. Any compatible Ethernet switch, including Lenovo RackSwitch top of rack (TOR) switches and integrated Flex System Ethernet I/O modules, can be used to provide iSCSI connectivity for the Lenovo Storage V3700 V2 and V3700 V2 XP iSCSI storage. With software iSCSI initiators, any supported 1 Gb, 10 Gb, or 25 Gb Ethernet adapter for Lenovo servers is compatible with the Lenovo Storage V3700 V2 and V3700 V2 XP iSCSI storage. Currently available converged FCoE/iSCSI adapters for Lenovo servers that are compatible with the Lenovo Storage V3700 V2 and V3700 V2 XP are listed in the following table. Other HBAs also might be supported (see the Interoperability Matrix for details). The Lenovo Storage V3700 V2 and V3700 V2 XP support direct FC attachments and FC switch-based attachments. Brocade and Cisco SAN switches can be used to provide FC connectivity for the Lenovo Storage V3700 V2 FC storage. Currently available FC adapters for Lenovo servers that are compatible with the Lenovo Storage V3700 V2 and V3700 V2 XP FC storage are listed in the following table. Other HBAs also might be supported (see the Interoperability Matrix for details). The following table lists currently available Ethernet and FC rack-mount switches that are currently offered by Lenovo that can be used with the Lenovo Storage V3700 V2 and V3700 V2 XP in storage solutions. The following table lists currently available Ethernet and FC embedded switches and pass-thru modules for Flex System that can be used with the Lenovo Storage V3700 V2 and V3700 V2 XP in storage solutions. The following table lists the rack cabinets that are currently offered by Lenovo that can be used with the Lenovo Storage V3700 V2 and V3700 V2 XP in storage solutions. The following table lists the power distribution units (PDUs) that are currently offered by Lenovo that can be used with the Lenovo Storage V3700 V2 and V3700 V2 XP in storage solutions. The following table list the uninterruptible power supply (UPS) units that are currently offered by Lenovo that can be used with the Lenovo Storage V3700 V2 and V3700 V2 XP in storage solutions.